So you’ve got your basic yellow sauce as a base, now you’re good to go to whip up a number of delicious dishes. Here’s a yummy chicken and coconut curry which is simply divine. 1. Slice the red chillies and remove seeds. Slice shallots, garlic, spring onion and the chillies. Peel and cut potato into 2 centimetre cuves. Cut the chicken into small slices. 2. Saute shallots, garlic and spring onion on a medium heat until light brown. 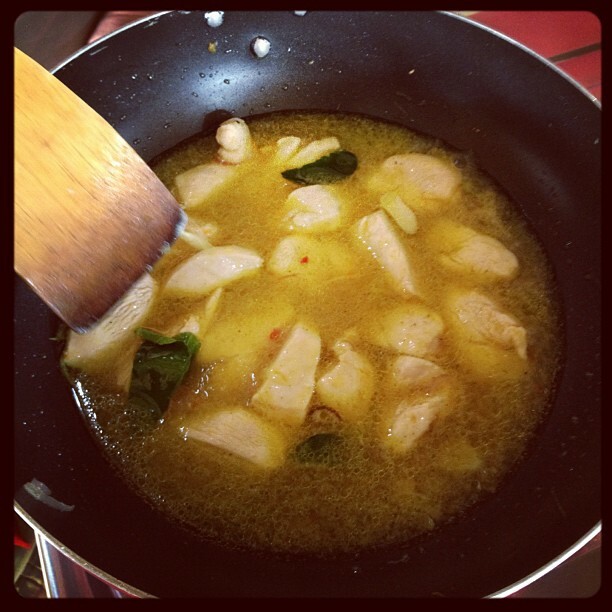 Add the base gede then the chicken and stir together. 3. Add the chicken stock and bring to the boil. Break the bay and kaffir lime leaves then add them to the stock, with salt and pepper to taste. 4. Add the coconut cream and keep on a lower heat for 2 minutes before serving. 5. Serve in a bowl with deep fried shallots as a garnish. I was too busy cooking to take many photos! But you can see the completed curry here.